2015 Ohio State Spring Football Questions: Who Else Besides Nick Vannett At Tight End? At first glance, it may seem puzzling that I have listed the tight end position group as a concern heading into spring practice. After all, Nick Vannett returns as the starter, and was instrumental in the 2014 season with nineteen catches and five touchdowns. Where I am concerned is the lack of depth and experience at the position. Jeff Heuerman, a 2014 captain who battled through injuries during the season, leaves behind more than just his seventeen receptions and two touchdowns. Heuerman was a capable and dependable blocker in the Ohio State running game. Losing an experienced and reliable blocker at a key position on offense has to be somewhat disconcerting. Yes, Marcus Baugh returns at tight end. Let us be honest – do you have any concerns about Baugh staying out of trouble after his first two seasons in the program? I am all for second chances, but it may not be far-fetched to suggest that the next offense could be the one that will result in Baugh being removed from the program. Baugh did play sparingly in 2014, with his lone reception resulting in a touchdown versus Kent State. Even if Baugh stays out of trouble, is Baugh the type of blocker who can assist with the Ohio State running game as Heuerman or Vannett did in 2014? Marcus Baugh just caught a touchdown pass. Didn't imagine typing that this season. It's 38-0 Ohio State. Here is an idea that I have read and heard from other Ohio State writers/bloggers/analysts regarding the tight end position ~ Noah Brown. Brown is listed on the official Ohio State athletic department website as a wide receiver. At 6’1″, Brown would not be in the traditional tight end mold like Vannett or Baugh height-wise, but Brown is a tremendous blocker. Perhaps Brown will be given some repetitions at both positions this spring, and the coaches will make a determination as to which will best help the team. In the 2015 recruiting class, A.J. Alexander and Rashod Berry were both listed at the tight end position. Both will arrive on campus this summer, and could make an impact upon the depth chart this season. Is the tight end postion a concerning one for Ohio State in 2015? In the grand scheme of things, no…as long as Nick Vannett stays healthy. Finding players who will be able to spell Vannett, or contribute with Vannett on two tight end set formations, is something Coach Meyer and Ohio State Tight Ends Coach Tim Hinton may want to determine before April 18th. Well just over a month ago most people who follow and cover Ohio State recruiting had Noah Brown as a lock to pick Ohio State to play his college career at. Then he took a step back from the process and a lot of people started to believe he was going to stay home and play for his home state school Rutgers. Funny thing about that was Urban Meyer clearly had a different opinion and kept recruiting Noah as hard as he was before he slowed down the process. That leads to todays news that Noah Brown has officially committed to Ohio State. Noah Brown has committed to #OhioState #Buckeyes get their 18th commitment of 2014. 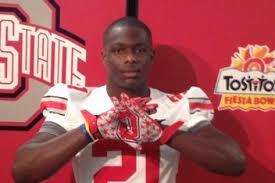 Noah Brown is a 6’2″ 212 lbs 4 star Ath/WR/RB/TE from Sparta, New Jersey. Noah last year as a Jr. had 4 KO return for TDs, He had 850 yards rushing with 14 TDs, Also had 41 catches for 630 yards and 6 more TDs. He is a big recruit with speed. He brings to the table another guy who can play multiple positions and on both sides of the ball if need be. He fits perfectly into the mold of what Urban Meyer is trying to do with his offensive philosophy. 247sports ranks him a 4 star and the 201st best recruit in the country. Rivals ranks him a 4 star and the 212th best recruit in the country. Scout ranks him a 4 star and the 201st best recruit in the country. ESPN ranks him a 4 star and the 13th best player in the country.